With over 1,100 investment newsletters in the marketplace, it’s more challenging than ever to attract new and loyal subscribers—especially when they’re wary of investing their hard-earned money in a volatile stock market. The 2008 crash was still fresh in the minds of investors, some of whom had lost a good portion of their life savings. Consequently, many of them dumped their investment newsletter subscriptions or opted not to renew them. So when Charles Payne, founder, CEO and chief analyst of Wall Street Strategies, Inc.—an independent stock market research company that includes a suite of investment research offerings—set out to market a newsletter amid one of the worst economies in recent U.S. history, he had his work cut out for him. That’s why he looked to Creative Direct Marketing Group, Inc. (CDMG) to help promote his newest service and signicantly grow his subscriber base. 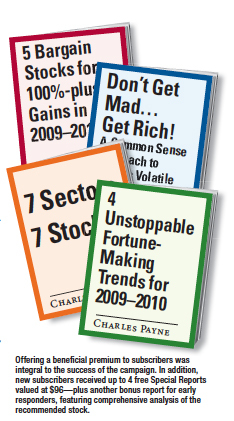 To stand out from other investment newsletter promotions, CDMG created a promotional multimedia campaign to appeal to cautious investors who hoped to regain what they lost in the 2008 market crash. uncertainty about the stock market. 3. Gain new subscribers in a difcult economy while overcoming resistance to subscribing to an investment newsletter again at a price higher than the competition. A direct mail “magalog” was created that arrived in a large envelope, along with more information on Charles. CDMG also enclosed a photo of Charles on TV to build additional credibility. Also created were emails, a special alert mailing, an outsert (a 4-page wrapper around the outside of a magazine), banner ads and paid search. These all pointed potential subscribers to one of several campaign-specic landing pages that featured video to further increase response and a oater to capture visitor email addresses for future promotions. In addition, CDMG came up with a compelling offer for Charles Payne’s Common Sense newsletter designed to win new subscribers, including 4 free Special Reports, a free bonus report for early responders and a 100% Money-Back, No-Nonsense Guarantee. As other investment newsletters saw their subscribers decline, the Charles Payne’s Common Sense subscriber base grew, which was remarkable considering the challenging economy and intense competition.